From the detail-obsessed mind of Edan comes an astounding pastiche of dance, rap and punk utilizing everything from turntables to tape echo, glockenspiel to guitar, moog to kazoo. Ever since the success of Edan's 2005 sophomore release, ''Beauty and the Beat'' people have been fiending for more. After it became clear that a new album was nowhere near completion, Traffic Entertainment ''had a eureka moment. We approached Edan with a unique opportunity; full access to Traffic Entertainment Group's extensive back catalog to mix and rework in any way he could imagine.'' The idea was a quick mix to get Edan's name back out there while highlighting Traffic's lesser known but quality back catalog. 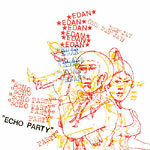 As it turned out, Edan transformed ''Echo Party'' into a colorful full on production album that also features him as a musician on live instruments including synthesizers, guitar, percussion, echoplex, even glockenspiel and kazoo. Elements are pulled from original multi tracks and isolated accapellas and drum breaks that have not been heard by any ears except the engineers and original artists on the original sessions. Other portions are more identifiable though obscured by the filter of Edan's ever improving studio techniques. Only Edan with his wild creativity crossed with borderline compulsive obsessions could have made this CD!